For those that don’t know, I meal plan for Cade and I. I find this to be helpful in many ways – grocery shopping, saving time throughout the week, preventing eating out, etc. I can get into this in more detail in the future. But anyways, for Saturdays, which we added to the meal plan after the move, I normally do something a little more fun/easy to prepare, because hey, it’s the weekend! 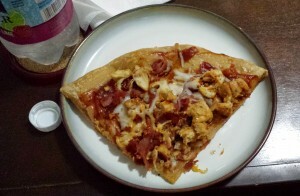 So, for today I decided to do a BBQ Chicken Pizza. I’ve made this pizza many times before and decided tonight that I would add some turkey bacon to it, because who doesn’t like a little bacon in their life. Also, who doesn’t love pizza? It can take many forms and almost always tastes amazing. Unfortunately, since pizza is normally horrible for you, we don’t order it out. But, making it at home opens up so many more options and can be way more healthy. So, 99% of the pizza we now consume is made at home. Cook the chicken however you prefer to cook it – bake, grill, etc. When we were in Bellingham this summer, we made some pizzas but instead of using the oven, we made them on the grill. They were AMAZING!!! Oh, that does sound amazing! I wish we could actually grill. I miss burgers on the grill and want to try pizza.